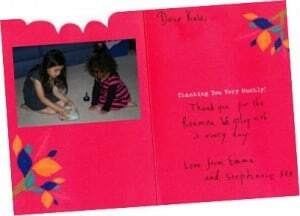 Roamer can support Early Years to High School teachers across most subjects. Its flexibility makes it useful in formal and informal learning; it works with gifted, remedial or special education. To see how it can help you check the tabs and various links. Activity Library: Example Roamer activities. Podcast: Videos and slide shows of Roamer projects. Tumblr: Picture stories of various Roamer projects. Valiant TV and various Roamer user videos. Roamer Research includes case studies and reports. Roamer News: Brief insights into Roamer projects. GO Magazine: Features on interesting ideas. The Roamer sings the nursery rhyme Incy Wincy Spider (Itsy Bitsy) – but it has got it mixed up. The students need to teach Roamer how to sing the activity in the right order. This sort of sequencing activity is a standard in Early Years classrooms where students rearrange pictures representing parts of the rhyme into the correct order. Using Roamer adds feedback. It makes the activity both concrete and interactive. 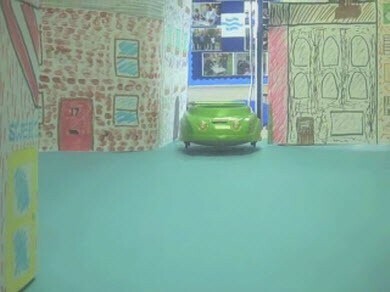 This activity provides students with a kinaesthetic, visual, auditory and spatial experience. Children project their imagination into the world around them. Things as simple as a piece of wood can become a creature with fantastic powers. 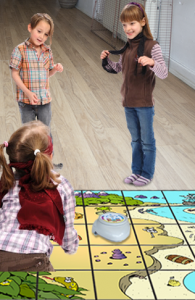 Roamer is a “piece of wood” that students can bring to life by making it move and turn.. In this one act they link their imagination and creativite play to the worlds of mathematics and science. Roamer has been called an “object to think with”. Students leave behind their ego centric nature, they look at the world from the Roamer’s viewpoint. They walk through problems and explore ideas using their bodies – they “play turtle”. It is important to know facts and for knowledge to be useful it has to be understood. Roamer activities provide the opportunity to discover facts, explore their meaning, limitations and relevance in a practical context. All of this is done in a way that promotes understanding and memorisation. When integrated with traditional teaching approaches you are able to create the type of learning environment that will help you maximise test scores. Dancing Roamers involves mathematical ideas of symmetry, rotation and translations. Roamer’s variable and speed change features a new levels of interest. They said they were afraid of failing, afraid of being kept back, afraid of being called stupid, afraid of feeling themselves stupid. Students need to feel the freedom and confidence to explore the world of ideas. Mistakes are not a catastrophe; but the launch a quest to find an answer. Roamer banishes fear and replaces it with a love of learning. People who love learning become life long learners. At this age typical activities rely less on intuitive and visual solving of problems. Students can use their knowledge to find solutions. Through practical Roamer activities they can develop and master important skills. The Robot Rally Race requires students to perform experiments to determine the robots speed and to engage with various statistical calculations. Involvement and motivation in the activity outcome transfers to the mathematics making the tasks meaningful to the students. To many students are bemused by what we expect them to learn. They may readily understand why they need basic arithmetic – but algebra, “When am I going to find that useful?” Roamer’s phyicality and the practical nature of Roamer activities add an element of authenticity to what we teach. Understanding a purpose to knowledge positively transforms students willingness to learn it. The Turtle [Roamer] started because I wanted to find something that could be picked up by very young children. Now I think of it as something that is as valuable for people of any age as for the very young childten. And again that is a general principle. What is good for thinking is good for thinking, whether you are a 5 year old or a sophisticated scientist. 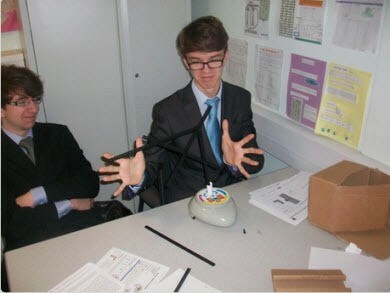 6th Form Student’s at Wilsons School, Croydon engaged in a practical mathematics activity on vectors. Special Education teachers were amongst the first educators to realise the potential of Turtle type robots. Whether working with students who are blind, have autism, downs syndrome or ADHD – whatever the learning disability teachers have found useful ways of adapting the technology to meet the needs of their students. This Roamer was specifically designed as an enhancement of the Classic Roamer to make this process easier to do. Its modular nature means you can change the way students interact with the robot. 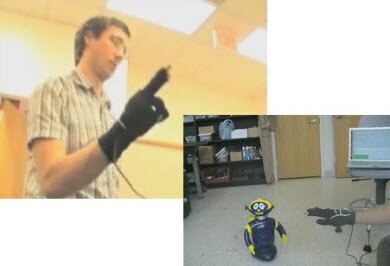 Designers testing Roamer with Cosmobot shell controlled by an Intelligent Glove. The GO Archives contain several other articles on Turtles and Roamer in special needs education. Personalisation is one of the central tenets of learning. It is about how you adapt the way you deliver the message to help the student understand. There are a wide variety of reasons why people choose home learning. Roamer’s makes it adaptable to the perspectives of the teacher and the needs and learning styles of the student. Roamer offers what is called a high ceiling and low floor programming experience. Easy to start, but capable of great challenges. It is simple for the most computer shy beginner to make something tangible happen with 3 simple keystrokes. At the same time, Roamer has the capability to set the best students interesting challenges – like creating a new Roamer behaviour. Are computers going to program children or children program computers? For many years children have sat in front of computers and explored what the program offered. Now we return to student programmers determining what the computer should do. This is Roamer’s ancestry; it is in its DNA. What Roamer has to offer is not something put together quickly because a new education policy. It has behind it 30 years of practical classroom experience. This is reflected in the Computing Curriculum Packs which connects computer science to all subjects in the curriculum. educational robots and computational thinking. There are many reasons a student can struggle to thrive in a school environment. 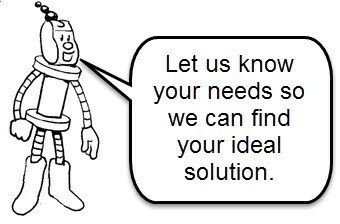 Remedial teaching starts with diagnosing what issues the particular student faces and devising a personalised plan to help them. Roamer is ideal tool for many of the typical problems faced in this situation. The nature of Roamer, the way it works, its flexibility and Valiant’s extensive support make it a powerful tool for remedial education. Roamer has been used by teachers in one-to-one tuition situations. But it also provides a means of working in small groups which when managed by the teacher can be beneficial to remedial teaching. The student may have difficulty understanding one or more concepts. A Roamer forte is its ability to help students build mental models through the provision of concrete examples of ideas that students can explore. In this process they are active learners experimenting in an environment where mistakes provide the foundation for understanding. Students may have weak mathematical skills, particularly in basic arithmetic. Roamer provides a number of activities which involve students building visual, spatial and kinaesthetic models of basic arithmetical ideas. 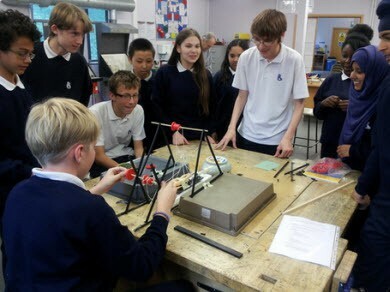 Many of the practical activities involve students making calculations and getting natural and instant feedback on whether their calculation was “correct”. In this process they have the opportunity to develop a sense of why their answer was wrong and by how much. Sometimes students are not clear on the procedure for solving problems. 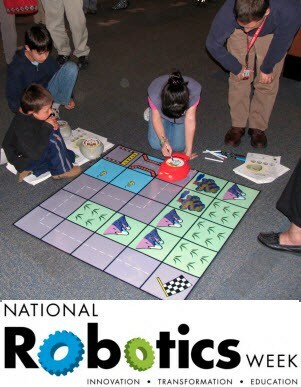 Roamer programming involves student’s developing algorithms. That working out a step-by-step procedure to resolve a problem. Roamer transforms an abstract process into a concrete procedure which is much easier to understand. Students may have problems seeing the relevance of what they are asked to learn, or how what to apply what they know. 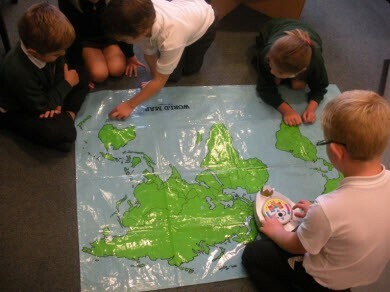 The practicality of Roamer activities involve students in applying knowledge. The authentic nature of many of the tasks and the general ability of Roamer to engage students combine to create a learning environment that helps resolve these problems. A common problem with students in need of remedial support is their inability to comprehend what they read. The practical and tangible nature of work with Roamer provides the opportunity for students to address this. Albert Einstein did not like school and school did not like him. The way that school works does not suit everyone. Roamer offers a different approach. It has a long history of engaging students and transforming their attitude. Transforming the attitude of an injured student. Some students find it difficult to express themselves. The adage actions speak louder than words is pertinent to the whole Roamer experience. Working with the robot allows you see what is happening beyond the communication problem, but it provides the student with means of self expression. It is a presentation aid and many activities culminate in students presenting their work. This is closely allied with the poor attitude to learning. Again Roamer offers an alternative paradigm which has a history of proving effective in helping resolve these problems. Personal factors can include physical impairments, lack of confidence, fear of failure, nervousness, etc. Roamer activities always involve the opportunity for the development of lifelong learning skills. This includes cognitive, emotional, social and personal. A teacher once adversely commented on the limitations of Roamer’s musical capabilities. A gifted music student overheard the conversation and programmed Roamer to play the first few bars of Bethovens 9th symphony. Imagination is the only limit. The nature of Roamer’s open ended challenges make it possible for students to express themselves and utilise their talents and push the limites of possibility. Roamer provides a platform that can be enhanced by different modules or by designs created by the students. Over the last 30 years there have been plenty of examples where ordinary students have suddnely come to life and shown they have talents beyond their teacher’s expectation. Irrespective of the students age, cultural background or gender Roamer can provide a challenge to the most gifted students. 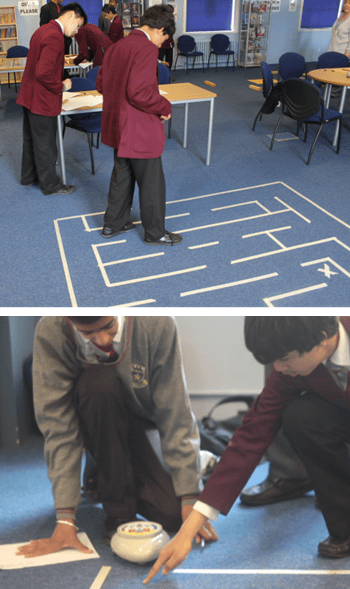 Students from St Joseph’s College Croydon working out the complex algorithms required for Roamer to navigate a difficult maze. After school projects either are a way of encouraging further study or they’re an attempt to keep students off the street and out of trouble. Attendance is voluntary and after a school day children and teachers are tired. Free from curriculum restrictions it is an opportunity to be adventurous, educational, motivational and enjoyable – all things Roamer excels in. This was the best project we have ever done. 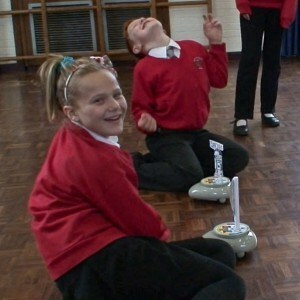 Scene from the Girlz Story – Robotics Performing Arts Project, Sydenham STEM Club. In normal lessons Roamer activities focus on particular subjects. In the case of an enrichment scenario you can be more open. Students are free to follow their ideas and passions unrestrained by a curriculum. Inevitably they will see knowledge holistically – not as a set of isolated facts, but as a set of interconnected ideas. It opens the opportunity for students to develop an important aspect of learning called transfer. They can see how ideas and strategies that solve one predicament can be used to solve other problems. Where Our Food Comes From project involves students engaged in mathematics, environment, food science, design technology and geography. Roamer has a lot to offer summer camps. Roamer attracts students. This is essential in situations where attendance is not compulsory. And while STEM work is a major attribute of many Roamer Activities and inherent to the nature of the robot, summer camps offer the opportunity to focus on different experiences. Free from constraints of curriculum and test present the opportunity for exploring knowledge in both an holistic and personal way. Adults saw it as curriculum; this transformed and they started to see it as culture. I was pleased to see that students wanted to learn more about indigenous math and science used in navigation process of the Canoe Journey. The moon, stars and land masses created a natural navigation laboratory. 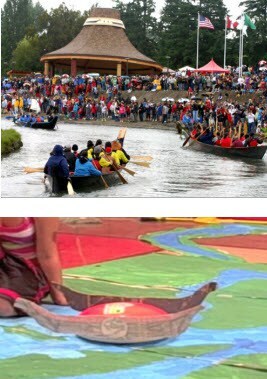 Squaxin Native American Students participating using Roamer to mimic the annual Canoe Journey Ceromony. Part of their Summer Camp in Seattle. Roamer and some Roamer activities can meet these criteria. Using Roamer is both natural and enjoyable. My 7 year old son was given a Roamer for Christmas. It was an inspired gift- he likes Maths anyway, but he found the Roamer really challenging and fun. And it kept him and his cousin quiet for the whole morning as they invented obstacle courses for each other to negotiate. 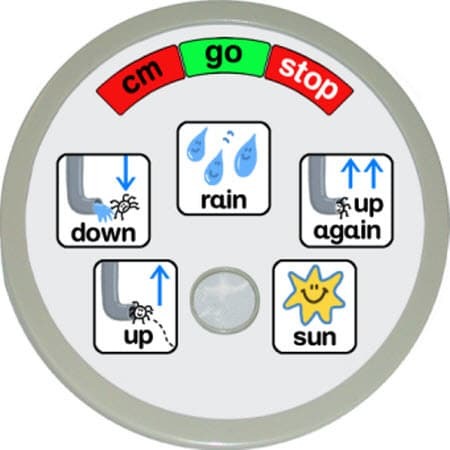 I had minimal input- which is how I like it… Once the basic programming idea was explained, he seemed to understand intuitively what to do – the fact that he seemed to be learning about degrees of rotation, and performing quite complicated calculations was an added bonus. Roamer is a tool. While it is simple to use it exemplifies best teaching practice. The principles of Assessment for Learning (AfL) provide a practical way of managing lessons while meeting the demands of a curriculum, but allows students the freedom to think, express their creativity and imagination and follow lines of enquiry that excites their interest. 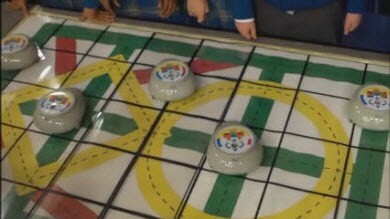 Valiant pioneered the use of AfL and educational robots and structured their free activities to support these principles. All this makes Roamer an excellent tool for trainee teachers to use.